I do not profess to be either good or speedy at cross-stitch. I generally leave the cross-stitch pieces to my mother (who is very good, and far speedier than I am) but not too long ago I came across some great, simple pieces on etsy that have called out to me. One of these is currently in progress, the other is finished and sent off to a swap partner. I stuffed it with some lavender that I’ve kept stored in an air-tight container; I harvested and dried it the first summer we lived here, when we discovered that I’m horribly allergic to it. Very short bursts of exposure don’t bother me too much so I threw the buds inside, sewed it closed and tucked it straight into the mail. The sewing was super quick and easy, but the stitching took me about 6 hours because I might just be the slowest stitcher ever. I’ve since stitched the 8th doctor in too, so I have 7 doctors left before I can wash, press and frame it. 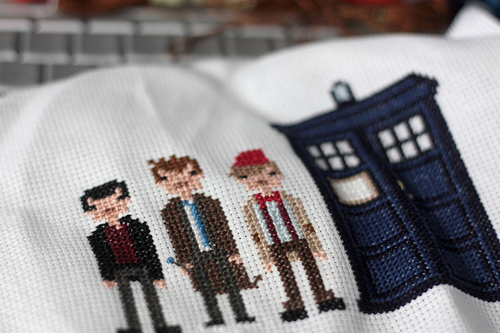 My one regret is that two of the doctors have a fair bit of un-outlined white and I chose white 14-count aida cloth to stitch it on so I might have to figure out how to help those doctors stand out from the background a little bit better. A note about some great service I received getting set up to start these projects. I bought most of my initial supplies at Mindy’s Needlepoint here in Eugene where I was treated with great respect despite my lack of knowledge about what I was buying. I was given a recommendation about what needle size was correct for what I was doing and got some great help in finding all of my floss colors. Two thumbs up. OMG, I love both of those. 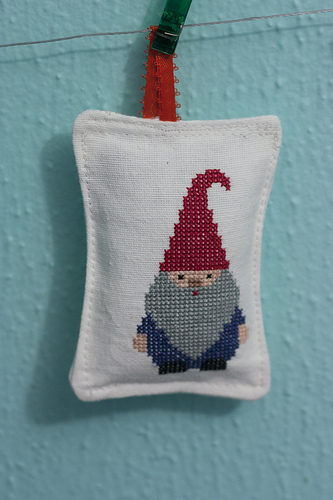 I’ve kind of been wanting to dip back into cross stitch again (I used to do it before I knew how to knit), but all the patterns I saw were just…bleh. But these? AWESOMESAUCE.